Is democracy a hot-house plant? Is it difficult to transplant it into new soil? The fall of so many dictatorships in the last few years—first in Southern Europe, then in Latin America, now in Eastern Europe—opens new, more optimistic perspectives on democratic development. The crises of dictatorships and the search for a new political order offer fertile ground for an examination of how best to effect democratic transitions. By focusing on the objective conditions that make democracy probable, sociological and historical theories of democracy often lose sight of what is possible. Here Giuseppe Di Palma instead explores those conciliatory political undertakings that political actors on all sides now engage in to make the improbable possible. His emphasis is on political crafting: in regard to constitutional choices, to alliances and convergences between contestants, to trade-offs, to the pacing of the transitions. 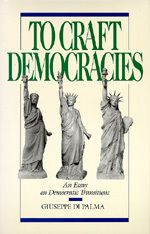 Di Palma also examines the reasons—stalemate, the high cost of repression, a loss of goals, international constraints and inducements—that may motivate incumbents and nondemocratic political actors to accept democracy, even in those cases, as in Central America and Eastern Europe, where acceptance would seem least likely. An original and imaginative work that, in the light of recent transitions, challenges our assumptions about fledgling democracies and breaks new theoretical ground, To Craft Democracies will appeal to anyone interested in the way we forge our political communities today. Giuseppe Di Palma is Professor of Political Science at the University of California, Berkeley, and the author of Surviving Without Governing: The Italian Parties in Parliament (California, 1977) and coeditor of The Central American Impasse (1986).